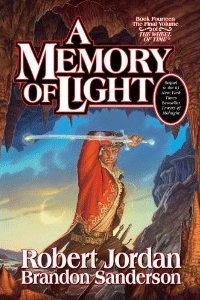 Review: A Memory of Light (The Wheel of Time, book 14) – Wanna Get Published, Write! Review: A Memory of Light, the fourteenth, and final, book in The Wheel of Time series is the culmination of just over two years in the lives of some really great characters that we get to see deal with the strain of the Last Battle. Some of the major players over the course of the series don’t get a lot of face time, while some characters that weren’t introduced until late, get quite a bit. Naturally, the three ta’veren lads get plenty of time. We see Rand Al’Thor, the Dragon Reborn, in his struggle against the Dark One at Shayol Ghul, Matrim Cauthon, the Seanchan Prince of Ravens, lead armies in battle, and Perrin Aybara, wolf brother, guard Rand’s back while seeking out Slayer in the wolf dream. The armies of the Light are made up of troops and common folks from all the nations of the world, as well as the White Tower, the Sea Folk, Ogier, and Aiel. The Tinkers even join in where they can without violating their “way of the leaf”. The forces of the Dark One are mostly what we’re used to seeing: trollocs, Myrddraal, Draghkar, the Forsaken, and some Dark Hounds…even Padan Fain pops back up. The Dark Tower fights on both sides: those loyal and/or turned to the dark side by Taim fight for the dark, while those who managed to stay loyal to Logain fight for the light. As the book has only been out a couple weeks at this point, I don’t want to spoil anything. I will say that the ending isn’t exactly what I expected. Some folks I expected or wanted to see live, didn’t, while others that I expected to see die, survived.